Singapore, Hong Kong, Macau and lately Malaysia. Seen them all and each country so far didn't fail to impress me.There are four more Southeast Asian nations in my list and one of them is definitely Thailand. I am ready to be awed by Thailand! Going to Siam seem to be elusive until now. That’s because I've been waiting for a perfect time to book Flights to Thailand but to no avail. Seat sales always shy away from my schedule. But I will get to Thailand sooner or later. For now, all I can do is to intensify my research about the country so that I will be ready to fly there when the opportunity presents itself. I have a few friends in Bangkok but I am still very ignorant about the place. It is still different if you see it yourself. Forgive me if I love touristy places but I always feel that one should satisfy the basics first before one can go deeper into the intricate business of knowing a country. Bangkok, who wouldn't want to see Bangkok? According to Euromonitor International, Bangkok ranked 5th most visited city in the world in 2010. International tourist arrivals of 10.3Million! That’s no joke. Bangkok must have a charm that captivates travelers want to see it's temple, it’s sky trains, it’s shopping malls where I heard goods are cheap, the skyscrapers and see how it compares to Manila and other Southeast Asian cities, even it's entertainment centers notorious for you know what. I believe a strong capital city is a very important component of a strong tourism industry. 1. The Grand Palace and Wat Arun---for sure it will not be called Grand Palace if there's nothing grand about it. It is of course the official residence of the Kings of Thailand. It is a palace complex made up of numerous buildings, halls and pavilions. I want to see it all! 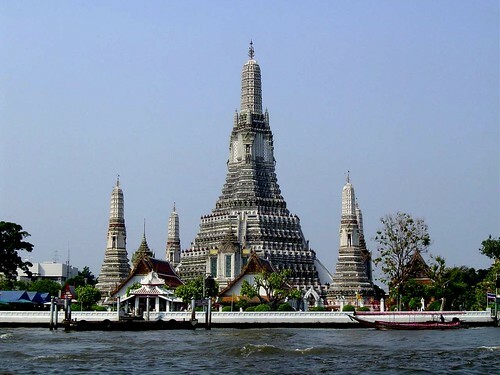 I imagine myself taking the river cruise to Wat Arun, probably one of the most well known landmarks in Thailand. This temple is named after Aruna, the Indian God of the dawn. It will surely be splendid to see temples this grand and old in a modern city. That’s something we are not so used to seeing in Manila. 3. Damnoen Saduak Floating Market---This place has been in my memory longer than I thought. I was young when I saw the image of merchants and their boats filled with goods cruising at the river. It is located 100 kilometers southwest of Bangkok. Food is a very important part of Thai culture. These mobile food stores sell anything from fruit, Som Tam, barbequed chicken, and other delicacies moving around Bangkok, on the streets just as an ice cream van does in most western countries. Cool!!! 4.Ayutthaya Historical Park --- Ayutthaya was the capital of Thailand from 1351-1767.A total of thirty five kings ruled Ayutthaya which translates to a rich history.It is located approximately 85kms North of Bangkok. 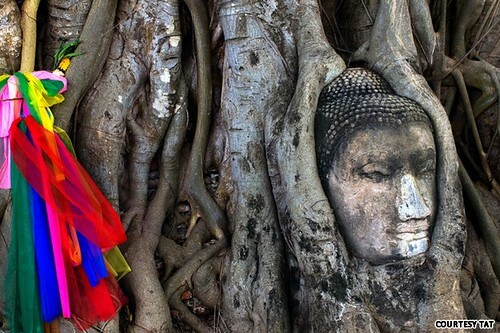 It is home to Ayutthaya Historical Park where the ruins of the old city could be seen. 5. The beaches of Phuket ---I know Phuket is so touristy but I need to understand why despite the claims of many of my friends who have been there that the beaches there are nothing compared to that of Boracay or Palawan, floods of tourists still come. I want to understand why Phuket is such a winner when it comes to tourist arrivals. CNN Go has recently published an article sighting 77 things to do in 77 provinces of Thailand and I am sure that is just the tip of the iceberg. There are so many things to see in this country and my list of 5 Reasons why I want to see Thailand is definitely lame. But as I said, I can go on an on writing about the many wonders of the Kingdom and would still fall short. For now, a wish list is where I want to start. Don’t worry, I will definitely blog extensively about it once I finally get a hold of those cheap flights and finally conquer Thailand. Lucky those who have already been there. Happy travels!!!! anton, am sure thailand will fascinate you no end. Having gone to several countries myself, I still consider it my most favorite country, even if i get to visit it every year. The food alone is worth the visit. For you to crave mcdo or kfc while there will be a big insult to the country. u have to take with you lots of memory cards because i'm sure u will be clicking and clicking that camera no end. before i forget, try to take notice of their colorful taxis; walang bulok na taxi na pumapasada. floating market lang napuntahans ko sa nasa listahan mo. Like you, I'm also waiting for the right time or more accurately, the perfect seat sale para makapaglamyerda din ako sa Thailand. Sana magkaron ng seat sale na may travel date na October or January para matuloy na ko! Nga pala, I heard so much about Krabi too. maganda din daw dun. I have only been to Bangkok. Do not miss the Siam Niramit show. Beautiful and impressive! I also wish to see the rest of Thailand in future trips. I would also want to visit those old temples in Thailand. Visit Ancient Siam, its their version of Nayong Pilipino,it has Miniature temples and palaces.